In our previous post, we generated a CYBORG COMMANDO character via the 'basic' character creation rules. In this post, we will examine the 'advanced' character creation rules. 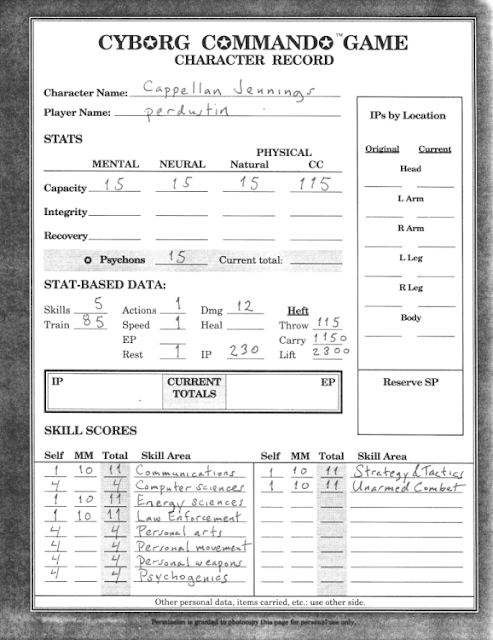 Specifically, we will convert our basic character, Cappellan Jennings, to the advanced format. Multiply the score in that field by 3. Divide that number of points among the Areas in that Field. You must place at least one point in each Area, for a resulting minimum score of 2 in each, counting the one you get free. So, Jennings' score of 3 in Computer Sciences becomes 9 points to divide among the three areas of the field: 'Ancient Computers', 'Modern Operation and Software', and 'Modern Hardware'. Allocated evenly (and given the 'free point' for each area) Jennings has a total score of 4 for each area. Like the Computer Sciences field, Personal Arts has three areas ('Mental Arts', 'Physical Arts', and 'Error Avoidance') so the calculations are the same. The Personal Movement field has six areas. Nine, of course, does not go evenly into six. After each area gets one point (as required), three points remain. Three areas receive the minimal allocation ('Land-Based Special', 'Aerial (non-powered)', 'Extraterrestrial') and three areas each receive one of the extra points ('Land-Based Normal', 'Aquatic Unequiped', 'Aquatic Equipped'). The Personal Weapons field has seven areas. In this case, five areas receive the minimal allocation ('Ancient Bladed Melee Weapons', 'Ancient Blunt Melee Weapons', 'Ancient Missile Weapons', 'Heavy and Special Weapons', 'Artillery') and two areas each receive one of the extra points ('Common Devices as Weapons', 'Modern Small Arms'). Psychogenics is actually two fields, one in the dynamic division and one in the static division. For the basic character, I failed to make the distinction. Now, let us decide upon Static Psychogenics, which has five areas. As such, all areas receive two points except 'Sending (One-Way Telepathy)', which receives only one. The advanced character creation rules do not reference the MadMac skills (either for original characters or basic conversions). Presumably, the same procedure applies. Since those fields have 10 'basic' points, 30 'advanced' points are to be distributed among the areas. As indicated above, Communications has four areas. Dividing the points as evenly as possible, two areas receive eight points ('Strategies', 'Tactics') and the other two, seven ('Simple', 'Electrical'). The two Energy Sciences areas ('Air, Light, & Sound' and 'Energy Sources') each receive 15 points. The same goes for the two Law Enforcement areas ('Investigations' and 'Suspect & Prisoner Handling') as well as the two Unarmed Combat areas ('Occidental Style' and 'Oriental Style'). The Strategy & Tactics field has three areas ('Personal Tactics', 'Personal Strategy', and 'Military S&T'), each of which receive 10 points. Once skills are converted, stats are adjusted. On the Character Record sheet, for each stat, there are rows for Capacity, Integrity, and Recovery. 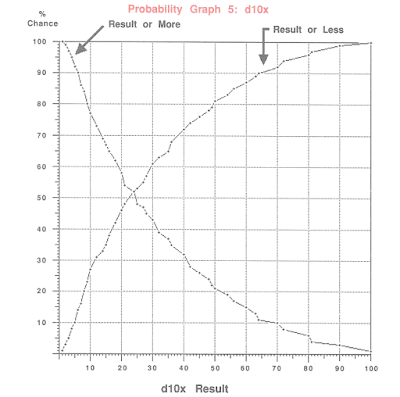 In general, 'basic' stat values are multiplied by three and the result allocated among the Capacity, Integrity, and Recovery for that stat. Because Jennings has 24 (non-MadMac) skill areas (even though he would rather do without some of them), he must have a Mental Capacity score of 24. This leaves 21 points to divide between Mental Integrity and Mental Recovery. Let's say 11 points to Mental Integrity and 10 points to Mental Recovery. For the Neural and Physical stats, Capacity, Integrity, and Recovery each receives 15 points. Stat-derived calculations are next performed. Psychlons equal Neural Capacity. The table on page 14 of the CCF Manual incorrectly states “Skills = ⅓ Mental Capacity,” when it should read, “skill areas not to exceed Mental Capacity.” 'Train' equals 100 minus Mental Integrity in hours. 'Actions' and 'Speed' are both derived from Neural Capacity and fractional Speed values are permitted in the advanced rules. 'EP' means Endurance Points, “which measure the character's stamina, or 'staying power. 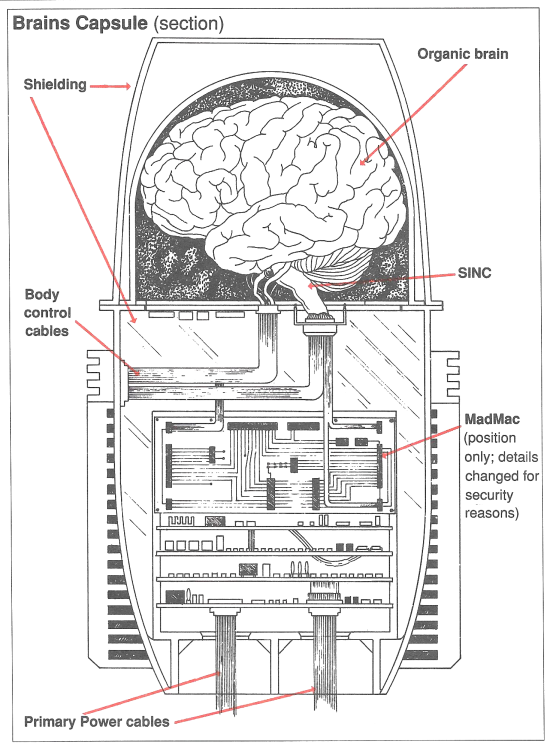 '” It is derived from Neural Integrity. I would think that a disembodied brain need not be troubled by fatigue poisons, but apparently I would be wrong. Rather than the “number of days the character can function before sleep is absolutely required,” the Rest score – derived from Neural Recovery – represents the amount of “EP per Travel Turn (2.4 hours) . . . recovered by sleeping.” In the advanced character creation rules, “Heal” is not referenced. The calculation of Integrity Points “= Physical Integrity × 3,” presumes the the Hit Location optional rule is in effect. Divide your total IPs by ten, and round down. Write that result in each space except the one labeled “Body.” Add all those figures, subtract the total from the original total IPs and write the remainder next to Body. 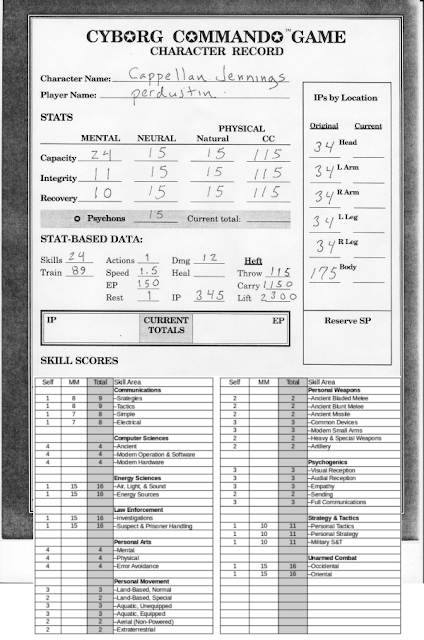 . .
My previously owned boxed set of CYB✪RG C✪MMAND✪™ contains a dozen or so copies of the character record sheet – waiting for an adventure that will never be. Let us make use of one of these records in generating a character. 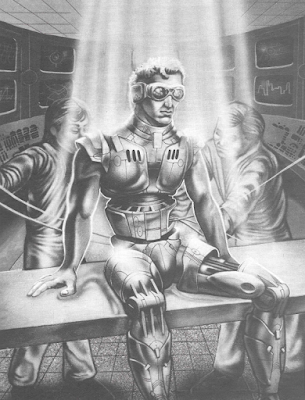 Step 1 is appropriately named “Start.” This step is about describing “your character – the human, that is, not the combined human-machine (cyborg) he or she will become.” We are informed that “the most important aspects of a character” are “Stats” and “Skills.” However, Stats and Skills are not described until later steps. Other details will be left to your choice. These include your character's physical appearance (height, weight, etc. ), historical background (home, education, etc. ), and basic psychological traits (outlook on life, likes & dislikes, and so forth). Step 2 is “Select Stats,” but a better description would be “Assign Stat Scores.” There are three Stats: Mental, Neural, and Physical. A player allocates “Points” among Stats and Skills. Said points are abbreviated as “SP” (“the S stands for both Stats and Skills”). Each character has 60 SP; at least 20, but no more than 50, must be allocated to Stats. An average adult has a value of 10 in each Stat, except men have a Physical Stat of 15 and women have a Neural Stat of 15. Let's just allocate fifteen points to each Stat. Step 5 is “Select Skills.” There are two Divisions of Skills: Dynamic (which includes the categories of “Movement” and “Combat”) and Static (which includes the categories of “Arts & Language,” “Sciences,” and “Law”). Among the five Categories there are twenty Fields. A Skill's score is measured as Skill Rating (SR). 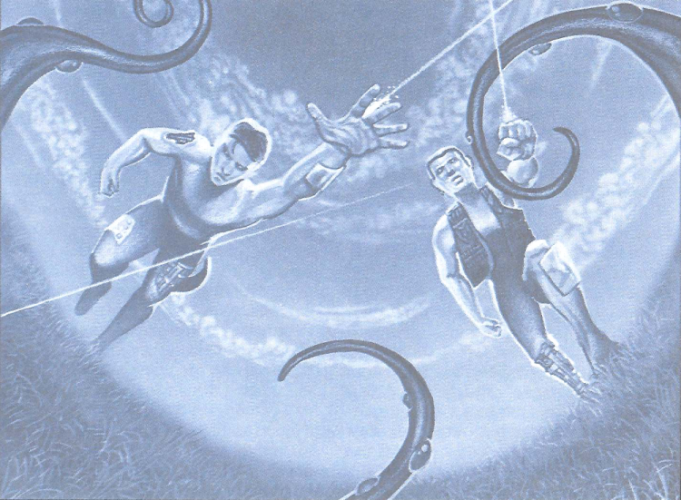 “Thanks to the intensive training before entering the CYBORG COMMANDO Force,” the rules state, a character “has a starting SR of 1 in every Field of knowledge, indicating a level of skill just above total ignorance.” SP not spent on Stats are allocated among Skill Fields; each SR costs 1 SP. Our character has 15 SP left and a maximum of five Fields, so we can assign 3 SP to each of five Fields: Computer sciences, Personal arts, Personal movement, Personal weapons, and Psychogenics. Step 6 involves “Other Details,” the nature of which were summarized in Step 1. If “Other Details” are decided in Step 6, there's really no reason to have the Step 1 that is described. Step 4 includes the statement, “Skills are determined in Step 4.” It would seem that, at one point, Step 1 was “Select Stats,” therefore “Select Skills” would have been Step 4. The “Start” Step 1 was probably added as an afterthought. Step 7 is “The CC Body,” in which Physical Stat-Based Data is figured. “The Physical Stat of the CC body equals [the character's] natural Physical score plus 100.” “Integrity Points” (IP) are effectively hit points; a character has a number of IP equal to twice the Physical Stat score. “Damage” is the amount of damage the character can inflict without weapons; it equals Physical / 10. “Heal” also equals Physical / 10; it represents the amount of damage a character can recover daily without medical aid. However, “this applies to organic parts only . . . The CC body does not repair damage unaided.” (I don't know why this data should be calculated from the CC Physical value.) “Heft” is the “amount of weight . . . that your character can Throw, Carry, or Lift.” If the Metric system is employed, weight is represented in kilograms. “Throw” equals the Physical Stat score, “Carry” is 10 × Physical, and “Lift” is 20 × Physical. That's it for basic character creation; next time we'll tackle advanced character creation. Both the Campaign Book and CCF Manual have the following statement on their respective title pages: “Special Thanks to Jennings Cappellan of the Rare Earth Information Center.” Jennings Cappellan is such an awesome name, I've decided to use a variation of it for the character. “Most people can multiply two single-digit numbers easily, and often with less trouble than adding two-digit numbers. 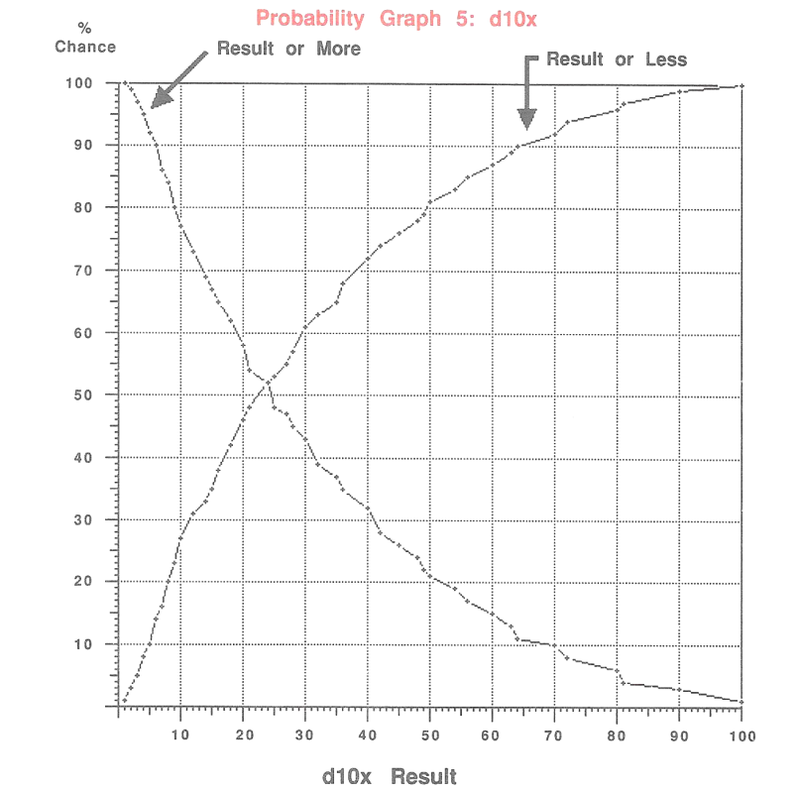 The average result of a normal d10x roll is 30¼. The median result is 24; that is, you are equally likely to roll either 24 or more or 24 or less. Exactly one fourth of all the possible results are odd numbers; three fourths are even numbers. Movement need not be announced at the beginning of the Combat Turn and does not count against the number of actions permitted to a character. If a character is not otherwise committing an action in a given phase, he (or she) may move two meters (or yards). The maximum number of yards (or meters) a character may move (under his or her own power) during a Combat Turn is ten times the character's Speed value. (Speed equals Neural Capacity divided by ten.) This movement allowance is reduced by terrain modifiers as well as what attacks the character attempts in the Combat Turn. For instance, “Each laser shot has a -1 movement penalty, and each grenade, a -2.” If a character forgoes an attack in a Combat Turn, the movement penalty imposed by that attack no longer applies. Starting characters have a Combat Rating (CR) of 10. If an attack roll is equal to or less than the attacker's Combat Rating, the attack misses, “not hitting anything.” Assuming the attack is not a clean miss, any modifiers are applied to the result. “If that total equals or exceeds the Defense Value (DV) of the target,” the rules state, “you have successfully hit it.” Every 'target' has five Defense Values, “one for each of the five basic attack forms.” These attack forms are represented by the acronym LITES: Laser, Impact, Thermal, Electro-magnetic, and Sonic. “The amount of physical damage the character's body can sustain” is measured in Integrity Points (IP). The damage inflicted by an attack “is either fixed or standard.” Hand-held weapons inflict fixed damage (1 - 20 IPs depending upon the weapon). Standard damage is equal to the original attack roll (with a possible modifier). Lasers – for example – inflict standard damage.